The invasion of the Marvel superheroes continues, as the Great Scott Project moves on to QuestProbe Featuring Spider-Man, a.k.a. QuestProbe #2, released in 1985, with adventure design by the legendary Scott Adams. The artwork is credited only to Marvel Comics in the game's opening notes, but the original box art credits Al Milgrom. Again, I am playing the IBM PC version -- the 4-color CGA palette suits Spider-Man's red and blue outfit more than it did the Hulk. This version also features something I never knew about -- Scott Adams' updated S.A.G.A.+ engine, a more sophisticated parser capable of handling phrases like TAKE GEM FROM AQUARIUM. However, many platforms (and the modern ScottFree interpreter) received an alternate version designed for the original two-word parser engine, and I discovered at least one puzzle that's different between the classic and S.A.G.A+ versions. So while the CASA walkthrough is immensely valuable as always, don't expect to play the "plus" version exactly as documented. As in QuestProbe #1, Spider-Man's story is standard adventure fare -- a computer simulacrum of your friendly neighborhood webslinger must collect and store a number of treasures to please the Chief Examiner, while facing down a number of fully licensed and trademarked Marvel villains. As seen in the previous game, the opening credits give away the game's entire participating rogues' gallery. Before we even set foot in Spider-Man's world, we know we will be encountering the evil MYSTERIO, DOCTOR OCTOPUS, ELECTRO, HYDRO-MAN, SANDMAN, LIZARD, and the RINGMASTER, as well as our friends the CHIEF EXAMINER (Scott Adams' Marvel Universe alter-ego) and MADAME WEB. I'm not sure I'm fond of this approach -- it strikes me as too distancing, but the game plays more or less in the standard way. And it does prevent the jarring "Hulk rampages off" situation I encountered while playing the first QuestProbe effort. According to a sign in the threadbare hallway where the game starts, our efforts will again be devoted to collecting all the available *Gems. We learn this by talking to MADAME WEB in her office at the north end of the first floor. I don't remember this character from the comics, but I'm no expert on the Marvel Universe. She offers to SCAN objects, which need not be present, and is the source of a number of hints. SCAN GEM reveals that we are to bring the gems here and say SCORE, so that little detail is out of the way; storing 2 gems scores 11 of 100 points, so we can deduce that there are 18 gems to be found. My interaction with MADAME WEB also revealed some new disambiguation code in the latest Scott Adams parser, but its approach to resolving confusing words inadvertently gives quite a bit of information away. SCAN DOCTOR yields When you say DR do you mean DOC's arm? ; typing N in response yields, in sequence, When you say DR do you mean DOCTOR OCTOPUS? ; When you say DR do you mean stunned DOC OCK? ; and When you say DR do you mean sleeping Doc Conners?. Finally the interpreter gives up with I don't know what DR means. Try again please., but we have gained some useful information about the dictionary and the game ahead. The IBM PC S.A.G.A.+ interpreter constantly beeps when text awaits acknowledgement; perhaps to cut down on the resulting annoyance, there's no room description offered on entering a room, so we have to LOOK to get the details. 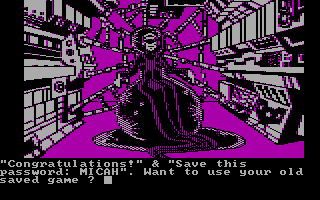 There's almost no plot here to speak of, and the structure is highly artificial, even by adventure game standards. Essentially, Spider-Man wanders through a sparsely-furnished office building, discovering villains waiting patiently in various rooms, where they say You'll never get MY gem! and do little else. Each presents a puzzle of sorts, of course, and we'll spend most of the game figuring out how to spirit the gems away from their colorfully costumed guardians. I spent some time trying to summon the elevator before it dawned on me that Spider-Man can simply CLIMB SHAFT directly to travel to other floors. But I needed a walkthrough to learn I could PUSH ELEVATOR further up the shaft to reach J. Jonah Jameson's penthouse apartment. There are also a number of gems hidden in niches in the elevator shaft -- EXAMINE ELEVATOR, for instance, responds I see mostly empty tool niches, a subtle hint that EXAMINE NICHES yields a gem. This can be done in several places up and down the shaft. The watery HYDRO-MAN, perhaps the least intimidating supervillain imaginable, stands next to an aquarium, which upon examination contains a gem in the water. TAKE GEM isn't a sufficiently detailed command for the new parser -- we must TAKE GEM FROM AQUARIUM, or at least try to do so, as HYDRO-MAN is not cooperative. I tried to DRINK HYDRO, was informed that I can't do that yet, and assumed this was a misleading turn of phrase. I was able to dry him out -- THROW CALCIUM CHLORIDE AT HYDRO-MAN -- but this technique seemed better suited to the LIZARD, so I kept hunting for a more appropriate approach. SCAN HYDRO in MADAME WEB's office yields the Adams-esque hint Solid!, but I discovered that FREEZE HYDRO is recognized but not immediately practical. With walkthrough assistance, I eventually discovered a thermostat in J. Jonah Jameson's condo, which can be turned down to 31 degrees, putting HYDRO-MAN into stasis -- he becomes an ice statue and is no longer recognized as HYDRO-MAN by the parser. We can now make off with the aquarium and thaw it out elsewhere; this is apparently a remarkably well-insulated building, as the ice melts instantly as soon as we turn the thermostat back up to 51. The Comics Code (of behavior) remains in effect -- Spider-Man is no KILLer or vandal, the parser politely informs us. Unfortunately, the constraints of the game design also mean he's not much of a Spider-Man. SPIN WEB early on yields only Sorry, I can't I've got no web fluid! This is clearly a call for puzzle-solving -- there is a handy chemistry lab on the third floor, where if we have found the formula we can MAKE FLUID and learn that... Sorry, I've got baby formula! I've got no useable formula! A partial version of the actual web fluid formula turns up, inexplicably hidden in J. Jonah Jameson's portrait, but is only partially successful, creating web fluid of limited capability. It's disappointing that Spidey never gets to go swinging from building to building, but can only climb the office walls and ceilings, casting webs at fans, buttons and a gem. The new interpreter recognizes IT as a synonym for the last noun used, and ALL works on multiple targets as well. USE is no longer allowed as a verb, probably because the new parser allows more sophisticated commands and doesn't have to rely on the generic catch-all approach. One new feature of the parser never really seems to come into play -- GO [object] can put us "at" the object within the room, when it's not actually a place to enter, but in my experience this was never necessary. We can TYPE KEYBOARD without GOing there first, for example. Fortunately, we can visit MADAME WEB, and SCAN SANDMAN hints that You're above him. CLIMB CEILING allows us to take the gem without causing SANDMAN to solidify. Another one bites the, er, dust. Or sand. Or... wait for it... never mind, stop waiting. The LIZARD lurks in a room at the south end of the first floor. MADAME WEB's SCAN LIZARD gives us the chemical formula for calcium chloride, CaCO3 + HCl- > CaCl2+. Mixing the hydrochloric acid (HCL is recognized as an abbreviation) and calcium carbonate found on the third floor gives us the expected result; THROW CALCIUM CHLORIDE AT LIZARD dries him out and turns him into sleeping Doc Conners, also previously mentioned by the parser talking in its sleep. We can EXAMINE DOC (if any appropriate item is present, the parser assumes we're talking about the obvious object instead of going through its entire dictionary) and get a *Gem. We can also GET DOC and carry him around, thanks to our amazing spider strength. This is actually not a bug, but a requirement. There's a nice puzzle involving MYSTERIO on the second floor. We see him run by repeatedly and vanish to the west, but FOLLOW MYSTERIO never works. When we travel W, we find ourselves on the side of the building and can see clear sky above, but can't go U to the roof or D to the street, nor can we CLIMB AROUND BUILDING even though the parser recognizes the command; our progress is mysteriously blocked. MADAME WEB's SCAN MYSTERIO tells us It maps odd!, which seems clear enough; this floor doesn't seem to fit the rest of the building structure. We have to CLIMB CEILING to get above MYSTERIO's illusory fog, and with a clearer head Spider-Man can see a duct in the ceiling that leads to another area. We can also drop down into the fog, where MYSTERIO hovers nearby in a vaguely threatening manner but never really does anything dangerous. I needed walkthrough help to learn we can FEEL NORTH and FEEL SOUTH to find hidden gems in this area; traveling E gets us out of the fog. The RINGMASTER appears in a room full of computer equipment and offers himself up as an easy target, saying To defeat me's easy! Push knob & turn it! But he can command Spidey to leave the room, making these actions somewhat difficult to pull off. We have to CLOSE EYES to nullify the RINGMASTER's power, enter the room, PUSH KNOB, then TURN IT, eliminating the evil circus impresario (is there any other kind?) and yielding a gem. Now we can TYPE KEYBOARD - Computer types: SYNTAX ERROR. I got lucky by employing a little vintage BASIC guesswork -- we TYPE RUN and Computer types: need 950 pounds of paper to start presses! LOOK PAPER doesn't help us here, but again the disambiguation routine helpfully reveals that we can find a torn piece of paper, a roll of blank paper, and a newspaper somewhere in the game. Once we've discovered the duct on MYSTERIO's floor, we have to SPRAY WEB AT FAN several times to slow it down, then SPRAY WEB AT BUTTON (on the opposite wall, past the still-spinning fan) to actually shut it off. GO FAN leads to a maze, but the only useful direction to travel is DOWN until we reach a room with a printing press, as well as a villainous Marvel Team-Up featuring DR. OCTOPUS and ELECTRO. Neither of these characters has anything interesting to say beyond the customary You'll never get MY gem! taunt, and they're not really working together, just setting up a puzzle. We have to HIT DOC first, so that he braces himself against the printing press and ELECTRO's bolt weapon hits the bad Doctor's arm, stunning him, then we can HIT ELECTRO with old-fashioned spider-strength fists and stun him as well. This activity yields a gem from each, but there's more to be done with their unconscious bodies, making this perhaps the creepiest Spider-Man tale ever. A control room to the west contains a 2-pound roll of newsprint, enough to print one newspaper, but not nearly enough to satisfy the computer that the presses are ready to roll. To make our 950-pound quota, we have to bring most of the large objects available to this room -- in my case, I stacked up the stunned DOC OCK, stunned ELECTRO, sleeping Doc Conners, frozen HYDRO-MAN, HYDRO-MAN's aquarium, the duct cover mesh from MYSTERIO's area, and J. Jonah Jameson's couch, desk, and clock to get the scale to 951 pounds. After running back upstairs to the computer to TYPE RUN again, then back downstairs to the press, we find a freshly printed newspaper. It features the inaccurate but understandably optimistic headline QUESTPROBE fever sweeps nation!, and it's also mentioned that Puzzle on page 2 says "A gem is in reverse new type!" This is a point of difference between the versions of the game for the two Scott Adams interpreters -- in the old one, we OPEN NEWSPAPER to yield a gem, but in the new engine, we must go back to the computer and (this was sheer luck and experimentation on my part) TYPE NEW -- Reverse new type, see? The CHIEF EXAMINER appears briefly and says "Congratulations!" Once we've collected most of the gems, as in the first game, we must deal with a Natter egg/*Bio gem combination to claim the last one. This time there doesn't seem to be anything living inside the *Bio gem, so the nature of these special ones remains mysterious. We can only learn these items exist by entering the first floor room where they're kept -- our spider sense tingles for a turn, then the egg explodes and takes the gem with it, as in the earlier QuestProbe game. We can escape the room and the blast, but it's too late to claim the *Bio gem if we do so. We can't use our web to contain the explosion, nor can we EAT EGG like the Hulk. As before, it ultimately makes sense to take the *Bio gem last -- when we have gathered the other 17 gems, we can approach the room from outside, LOOK WEST from the safety of the hallway, CAST WEB AT GEM, and claim it without disturbing the Natter egg. Of course, this isn't entirely fair, as we can only learn the egg is in there by entering the room and either dying or losing it one turn later. At least the new interpreter has a RESTORE GAME command that can be used to backtrack without having to QUIT, though the convenience is somewhat offset by the solitary SAVE GAME slot available. Once we have claimed all the gems, we obtain another password from the CHIEF EXAMINER which we are directed to save for future reference -- this time, it's MICAH. So we have MICAH and ARIA so far; presumably if all twelve QuestProbe games had been produced as planned, these would have added up to something. With the series cut short as it was, they are just curiosities. I didn't enjoy QuestProbe #2 as much as #1; it feels mechanical at best, and Spider-Man and the text adventure do not mix well at all. Spidey spends the entire game trapped in an office building -- he can climb on the walls and the ceiling, but the dynamic and acrobatic nature of the character is otherwise missing in action. The aspects of Spider-Man as a character that could survive in an interactive fiction context are unfortunately also missing -- Aunt Mae isn't ill or even mentioned, Mary Jane isn't upset, Peter Parker isn't worried about money, and J. Jonah Jameson only appears in portrait form. Even within the standard QuestProbe gem-hunting construct, the plot is nonexistent -- it's just a succession of recognizable Marvel villains, parked around the map more or less at random. 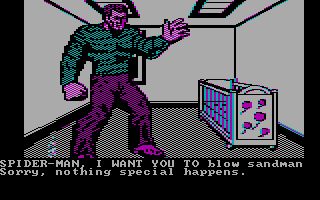 The first QuestProbe game treated the Hulk reasonably well as a character, and his brute strength was useful for solving puzzles. Spider-Man is kind of a cipher here -- he could be the Human Fly and the story, such as it is, would work just as well. Of all the machines avaialable in that era the IBM CGA graphics where the worst! You had a 4 color palette of really horrible fixed colors. If you ever get a chance to play this on an ATARI ST machine you will see an incredible difference. Also the games were still made to work with the limited memory of the low end machines so I wasn't able to do much in filling in back stories etc. Ah well it was still a lot of fun to be able to work with the Marvel universe and the incredible people I met at Marvel back then. Something I will always cherish! I owned an Atari ST back when the PC was still mired in the CGA world. But sometimes I have to play 'em as I can find 'em, and anyway I'm always interested in the technical compromises that had to be made to release these games across various platforms. Not to mention the artistic compromises made to fit these more ambitious games onto the older machines in the first place! This was an exciting series and I'm sorry you didn't get to continue it -- judging from QuestProbe #3, which I'm writing about next week, it was starting to hit its stride just as the industry crash arrived. I wasn't too sure where to comment, but I'm thrilled to have found your site (and I look forward to perusing your stories.) We just got The Amazing Spiderman game, and I was reminiscing to my husband about this old Spiderman computer game I used to play way back when. I couldn't for the life of me remember its name, but thank god for the internet - so happy I was when I found your post! I poured hours into figuring out the text commands and keeping track of my progress on paper (because I wasn't so good at remembering where I had been). It was so very fun still, and one of my few text-based game experiences. Now that I remember it all, I may have to write about it myself. Thank you for jolting my memories! Thank you for stopping by and commenting, Cary! Jolting memories is what I'm all about here -- my own, my readers', and sometimes even the authors of these games stop by to reminisce. I have a 5 1/4 floppy disk of this game how much is it worth?